There are many changes happening in my life: in May, semi-retirement from Glynn Visual Arts Pottery Studio Director. I am still teaching adults and kids at GVA and loving that! I am also starting my 4th year teaching at College of Coastal Georgia—Intro to Ceramics and Intermediate Ceramics. Love teaching there, too! I am also enjoying being a grandmother to 3 1/2 yr. old, Philip and 4 month old, Eva Izabella!!! Nothing like grandparenthood!!! After taking a 2-month “claybattical” away from the studio and working in clay, I am back at it. I was so excited to spend the day working in solitude at the college studio before classes started. (I have been working in community for most of 30 years!) So, I figure it is time for some changes to my standard functional work. 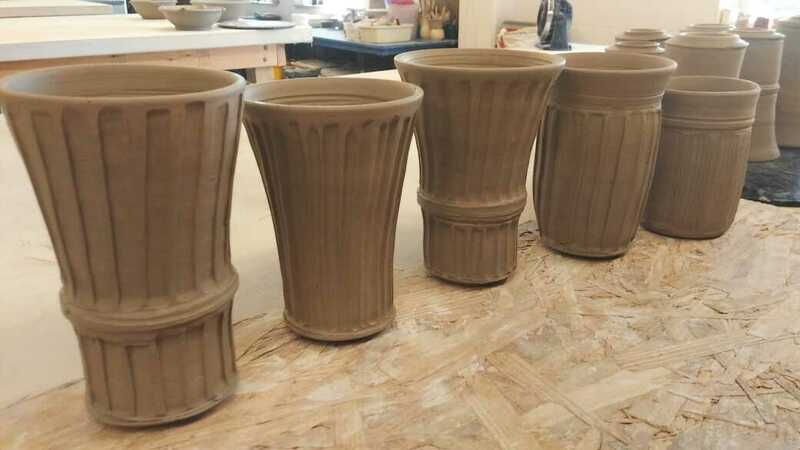 I started with tumblers and did some “fluting” with different size tools. I plan to continue exploring this technique. I do not do any fancy glazing techniques and my surface decoration is mostly stamping texture, but some form of carving will give my surfaces some different kinds of texture. It forces me to throw thicker and leave the surface very smooth—-very different for me…will keep you posted!